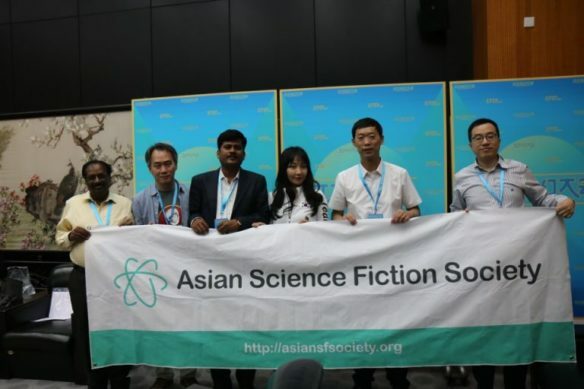 c) to propose the cognition of Asian SF in the rest of the world. The first Asiacon will be held in Chengdu in 2019. Date and venue TBC. More information about ASFA can be found on their website and Facebook. (2) FUTURE TENSE. Joey Eschrich, Editor and Program Manager, Center for Science and the Imagination, and Assistant Director, Future Tense, sent the link to the latest story in the Future Tense Fiction series: “The Starfish Girl” by Maureen McHugh. Are elite athletes who undergo cutting-edge medical interventions after injuries benefiting from performance enhancement, and doing so to the degree that they should be barred from competition? What if the athlete suffered from an injury so traumatic that it made the medical intervention necessary? And anyway, if we expect these world-class athletes to strive to be the best—you know, whatever it takes—why should the organizations that govern competition have the power to force athletes out of certain treatments they deem to be on the bad side of “clean sports”? What other projects have you got going on this year? I’ve got two albums coming out, a country music album and a Christmas album. The country music album, called “Why Not Me?,” will be out in middle of the summer (Aug. 10), and then the Christmas album will be out in October. In between, there’s a book called “Live Long and …” We’re putting the final touches on it now, and I just keep thinking, “God, there’s something more I could have done there. I wish I’d done something here or something there.” There’s always this self-criticism, especially when you don’t have the ability to change anything anymore. And that’s frustrating. But you try and bring the lessons along for the next time. And what’s the Christmas album called? That’s a great title. Did you come up with it? No, I wish I had. I remember I was in a room somewhere with a few people, and somebody said, “What’ll we call it?” I said, “Gee, I don’t know.” Then somebody popped up with “Shatner Claus,” and we all laughed and said, “That’s it!” Just like you did. That settled it. There was no more discussion. (5) THE YEAR OF THE EMERGENCY HOLOGRAPHIC TEXANS. Fanhistory resource Fanac.org has added videos of LoneStarCon 2’s 1997 Hugo Ceremony. In this video, first Neal Barrett, Jr. delivers some comedic remarks. There are philosophy jokes, famous writer jokes, and even a National Republican Party Loyalty Test (which has nothing to do with politics). Next, there are presentations of several other awards, including the Seiun Awards and acceptance speech by Rob Sawyer, Forry Ackerman’s announcement of the Big Heart Award, and Stanley Schmidt’s presentation of the John Campbell award. Thanks to ALAMO (Alamo Literary Arts Maintenance Organization, Inc) for both these videos. In this video, the Hugos are awarded, interspersed with funny comments by Toastmaster Neal Barrett. Presenters include Teddy Harvia, Pat Cadigan, Ellen Datlow, Guest of Honor Don Maitz, Robert Silverberg, Michael Moorcock and Algis Budrys. Recipients include Martin Hoare, accepting for David Langford (with an unusual acceptance speech), Bob Eggleton (with much ado about hair), Gardner Dozois, Connie Willis and George R.R. Martin. George talks about his winning novella which is part of his novel, Game of Thrones. Stanley Kim Robinson won the Hugo for Best Novel at this event. 20th Century Fox Television, who produced the original Joss Whedon drama, has offered a new take on the beloved Sarah Michelle Gellar drama in development. Writer Monica Owusu-Breen, who worked with Whedon on ABC’s Agents of SHIELD, has been hired to pen the adaptation and serve as showrunner on the reboot. UPC, the Social Council of the University and the Sitges Foundation International Film Festival of Catalonia have signed, on July 20, an agreement through which the International Fantastic Film Festival of Sitges will host the award ceremony of the UPC Prize of Science-Fiction 2018, a prize that rewards unpublished stories in this literary genre. The award ceremony of the UPC Science-Fiction Award will be held within the framework of the 51st International Fantastic Film Festival of Catalonia , which will take place in Sitges from October 4 to 14, 2018. The awards ceremony will take place, In particular, during the Taboo’ks day , dedicated to fantastic literature and its connection to the audiovisual sector and whose goal is to be the seed of a future market for literary rights aimed at the audiovisual sector. Taboo’ks, which is supported by the Federation of Publishers’ Guild of Spain and the Saló Liber, will host the presentation of four works that can be adapted to the cinema and a project adapted to it. The UPC Prize of Science-Fiction 2018 , organized by the Social Council of the Polytechnic University of Catalonia (UPC) since 1991, was convened in January of this year and the deadline for submission of candidatures ended the past June 15 The jury of the prize will meet next September to decide the winning works. The agreement signed with the International Fantastic Film Festival of Catalonia Foundation also provides for the exploration of other avenues of collaboration with the UPC in future editions of the Festival, such as the organization of a hackató to design 3D models of characters Fantastic or a test competition to be overcome from a smartphone with geolocation. Born July 24 – Lynda Carter, 67. Wonder Woman series, of course, but genre roles include the Supergirl and Smallville series, and Slayer, a vampire film. Rumoured to have role in the forthcoming Wonder Woman film but that’s very much unconfirmed even at the just held SDCC. Born July 24 – Patty Jenkins, 47. Wonder Woman and Wonder Woman 1984, appears in Robert Kirkman’s Secret History of Comics as herself in “The Truth About Wonder Woman” episode. Born July 24 – Rose Byrne, 39. Roles in Star Wars: Episode II – Attack of the Clones and several X-Men films; also in Peter Rabbit. Born July 24 – Anna Paquin, 36. Sookie Stackhouse in the True Blood series, and Rogue in the X-Men film franchise. Born July 24 – Elisabeth Moss, 36. Roles in The Handmaid’s Tale, the animated Green Lantern: Emerald Knights, Ghost Whisperer, Medium, The Animaniacs and Batman: The Animated Series. Born July 24 – Emily Bett Rickards, 27. Felicity Smoak in the Arrowverse, live and animated alike, also Paranormal Solutions Inc., a ghost hunters series, and Soldiers of the Apocalypse. (10) WORLDCON 76 – NEW PROGRESS REPORT. Worldcon 76 Progress Report 4 can be downloaded by anyone. Progress Report 4 is now available online. Over the next week, if you opted in to paper copies, you should see it in the mail. Check inside for information about Traincon, Tours, more places to visit while you’re in SJ (including wine country! ), a shopping guide, and more memories from fans. (11) WORLDCON 76 CHILD CARE. (12) WTF? Yahoo! Entertainment is reporting “Marvel Provided Grief Counseling Sessions at Comic-Con for People Still Devastated by ‘Infinity War’ Ending”. The booth featured posters with positive affirmation quotes like “We Are Groot” and “You are Stronger Than Vibranium.” Once inside, a group of 10-12 fans met with an actor posing as a counselor. The session included fans working their way through the following questions: What’s your first memory of the MCU? What was something it did that surprised you? What was it like when you saw the end of ‘Infinity War’? Who was the most shocking loss? The final part of the process was the chance to take a group hug photo with a giant Hulk. While inside the booth, fans were treated to donuts and got the chance to watch a deleted scene from the movie. You can read more about the Marvel booth at io9. (13) MAY WE PRAY. [Item by Mike Kennedy.] A rare authenticated Lunar Landed microfilm copy of the Bible—this one from Apollo 14—is going up for auction (LiveScience: “Rare ‘Lunar Bible’ That Visited the Moon Is Up for Auction”). During the height of the race to the Moon, the Apollo Prayer League sponsored microfilmed copies of the King James Bible to sent on various Apollo missions. There were reportedly 512 copies on Apollo 14 alone, though only 100 of them were put in the Lunar Module to make the trip all the way to the Lunar surface. Hundreds of these so-called lunar Bibles — 512, to be exact — were bundled in packets and carried by Apollo 14 to the moon. The lunar module held 100 copies, 200 copies were officially stowed in the command module and an additional 212 copies were secretly hidden aboard by NASA microbiologist and [Apollo Prayer League (APL)] board member Harold Hill prior to launch, according to APL. The microfilm has been “mounted and framed in a gold-and-enamel setting” and the auction includes the Mitchell/Stout authenticity certification. Online bidding opens at $50,000 and runs through at least 5 PM PDT Thursday 26 July 2018. The auction is being handled by Nate D. Sanders Auctions. (14) MORE POPULAR THAN JESUS? “Facebook angers Flanders with Rubens ban” – a classic painting is barred from FB due to underdressed corpse. The Flanders Tourist Board has written an open letter protesting against Facebook’s “cultural censorship” of adverts showing paintings by Flemish painter Peter Paul Rubens. The removed ad featured the artist’s The Descent from the Cross, which shows a bare-chested Jesus. Following the ban, the authority made a satirical video with fake investigators ushering visitors out of a museum after they looked at similar paintings. Facebook has not yet responded. (15) PRESENT AT THE CREATION. In “China fossil tells new supercontinent story”, BBC reports on evidence that Pangaea lasted longer than previously thought. (16) NOT THAT YOU ASKED. Ron Charles in the Washington Post reports that a paper by four Dartmouth professors, led by anthropologist Nathaniel J. Dominy and English professor Donald J. Pease, conclude that the Lorax is based on patas monkeys Theodore Geisel saw during a trip to Kenya in 1970: “Is Dr. Seuss’s Lorax real? These professors may have solved a 47-year-old mystery”. (17) COMIC (HOPEFULLY) RELIEF. I’ll probably wind up being sorry I laughed at this.